Surrounded by the Gwydir forest in the Snowdonia National Park, Afon Gwyn Country House is a comfortable walk from one of Snowdonia's most delightful villages, Betws y Coed. 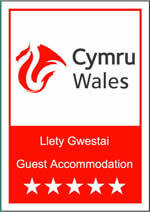 If you are looking for the best 5 star bed and breakfast accommodation available in the area you will find Afon Gwyn doesn't disappoint. Ideally situated for exploring the whole of North Wales, castles, mountains, beaches, gardens, mines and museums are all within a 45 minute drive. Converted into a boutique B&B in 2006, Afon Gwyn offers 5 truly individual rooms with charming features, from quirky ceilings to lavish bathrooms. Whatever the budget, guests will feel relaxed and at home after a day exploring everything North Wales has to offer. Reviews - what the guests say! 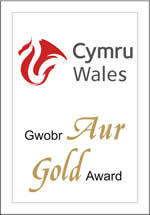 Gold Award winners 2015 - Visit Wales highest accolade ! Details of offers and discounts are available on our offers page. One night stays are charged at the weekend rate. Children over the age of 10 are welcome - an extra charge of £30 per night applies for rooms shared with two adults. A minimum stay of 4 nights apply to all Bank holidays stays. .
As all our rooms are doubles, a Single occupancy discount may be applicable depending on availability. The house has free Wi-Fi internet access. All bookings are secured by the payment of one night's stay which acts as a non refundable deposit. Rooms are available to Check-in to between 3.30pm and 9pm. North Wales' best known tourist destination, Betws-y-coed, a pretty village with cafés and restaurants for every budget. All the main attractions in North Wales are within an hour's drive. We love food at Afon Gwyn and work hard to ensure our breakfast is a pleasure! Served in the elegant conservatory, breakfast is a delight, from a light and fluffy omelette to a full cooked welsh breakfast or for the indulgent, waffles with homemade stewed apple and cinnamon, all are made from the best local produce and organic where possible. We ensure you walk away set up for a pleasurable day. Afon Gwyn is located alongside the river Conwy, just south of the beautiful Snowdonia village of Betws-y-Coed.